Is a table the right solution? Tables should be used to display data that needs to be aligned in rows and columns to be meaningful. With the rapid growth of mobile web access, we need to consider the user experience on all size devices. If you create a table, be sure to view the page on a phone or reduce the width of your browser window to simulate a mobile view. At this point evaluate if a table is the best solution for the content. Place your cursor where you'd like to insert a table, open the Table menu ( ) and select Table. 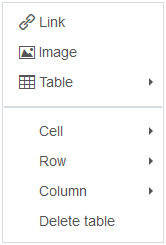 Highlight the desired configuration of rows and columns and click the grid to insert the table. You can also right-click anywhere in your content to insert a table. 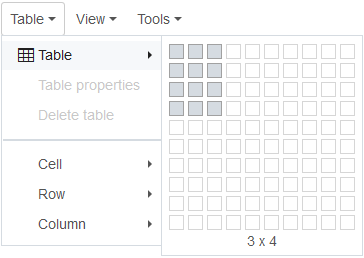 Place your cursor in an existing table and open the Table menu ( ) to access the table properties dialog or delete the table. Most settings in the Table properties dialog do not apply. Instead, apply the tablespecial format later using the WYSIWYG's Formats sub-menu. This will style your table to complement the website's design. 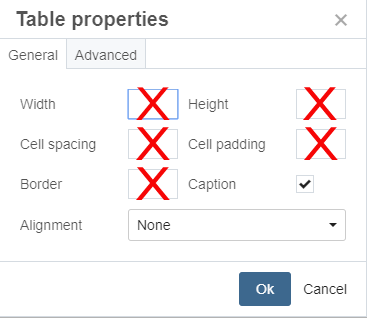 Right-click in any table cell to bring up additional table editing options. From here you can insert, delete or merge individual cells, rows and columns, or delete the table. To get this style, select the table by placing your cursor within the table and clicking "table" in the path display at the bottom of the editor. Then, open the Formats sub-menu, and select Custom > tablespecial. To achieve the darker row, right-click on a cell then select Cell > Cell Properties. On the Cell Properties dialog box you change the Cell Type to Header Cell, and the Scope to Column Group.